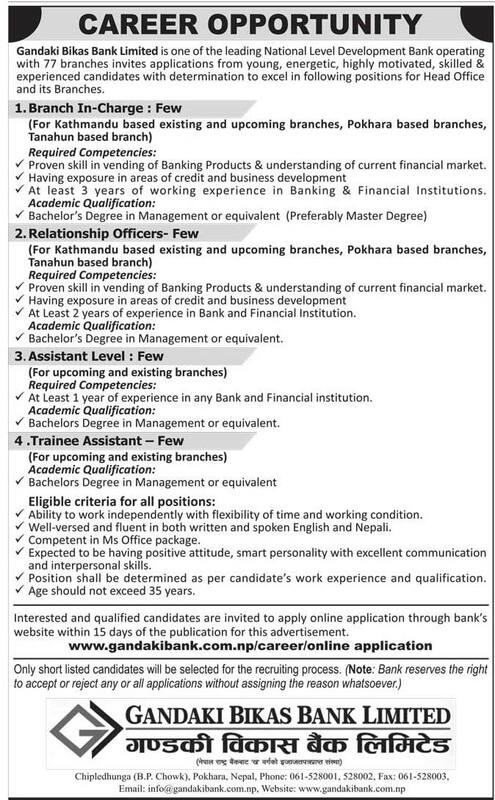 Gandaki Bikas Bank Limited is one of the leading National Level Development Bank operating with 77 branches invites applications from young, energetic, highly motivated, skilled & experienced candidates with determination to excel in following positions for Head Office and its Branches. > Ability to work independently with flexibility of time and working condition. > Well -versed and fluent in both written and spoken English and Nepali. > Expected to be having positive attitude, smart personality with excellent communication and interpersonal skills. > Position shall be determined as per candidate’s work experience and qualification. > Bachelors Degree in Management or equivalent. > Proven skills in vending of banking products & understanding of current financial market. > At Least 2 years of experience in Bank and Finance institution. > Bachelor’s Degree in Management or equivalent. > Proven skills in vending of Banking Products & understanding of current finance market. > At least 3 years of working experience in Banking & Finance Institutions.